Provide comfort for the family of Dwight Wood with a meaningful gesture of sympathy. Dwight V. Wood was born July 12, 1958 to parents Howard and Margaret Wood in Ada, Oklahoma, and went to be with our father in Heaven on February 6, 2019. Preceded in death by his parents, he is survived by his loving wife of 32 years Pamela “Penny” Wood; children Tracy Compton (husband John), Brook Carmona, Ericka King, Christopher Wood (girlfriend Sylvia), Brandon Wood (wife Baileigh), Randy Sopko (wife Betty), and Zeke Little (wife June); 17 grandchildren; 6 great-grandchildren; his siblings; John Wood, Mike Wood, Tim Wood, Debbie Gunter, and Cheryl Stephens; as well as several sisters-in-law, brothers-in-law, nieces and nephews. As his wife each of his children would tell you, no man could be a better father. He would drop whatever he was doing to help his family, no matter how big or small the task. There was never a doubt in any of their minds just how much he loved them. He truly understood the meaning of unconditional love and kept his family grounded with his quiet strength. Known to many of us as the Papa Bear, the big guy, Papa, Dad, or simply Pop. Dwight presented a gruff, tough guy demeanor to the world. When it came to protecting his own, he could be as fierce as the tigers he loved. However, if you spent any amount of time with him, his huge loving heart and clever sense of humor would shine through. Over the course of his life Dwight lived in Oklahoma, California, Nevada, and Arizona. 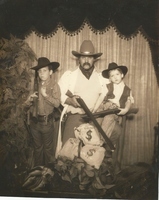 He was always a fan of the old wild west and especially John Wayne. Living in rural Three Points, Az for the last 4 years, Dwight found his own little piece of the wild west. As we deal with the shock of losing you, we miss you terribly and our hearts are hurting. Although we will miss you every day for the rest of our lives, we are comforted with the knowledge that you are with our Lord and Savior. Until we meet again… we love you Pop and Mom’s Big Guy! To send flowers in memory of Dwight Wood, please visit our Heartfelt Sympathies Store. The Garcia's & Callaways sent flowers to the family of Dwight Wood. The Garcia's & Callaways purchased flowers for the family of Dwight Wood.